Science is filled with fiction on tales of traveling through wormholes and the reality of this type of travel is somewhat complicating though we are yet to identify one. A theoretical passage on long journeys in space across the universe with shortcuts created, known as wormholes are, predicted by the theory of general relativity, though they tend to bring about high radiation, sudden collapse together with dangerous contact with exotic matter. Wormholes comprises of two openings which are spherical with a throat connecting the two. The throat could be a straight stretch and it could also wind around taking a longer route than a conventional one. 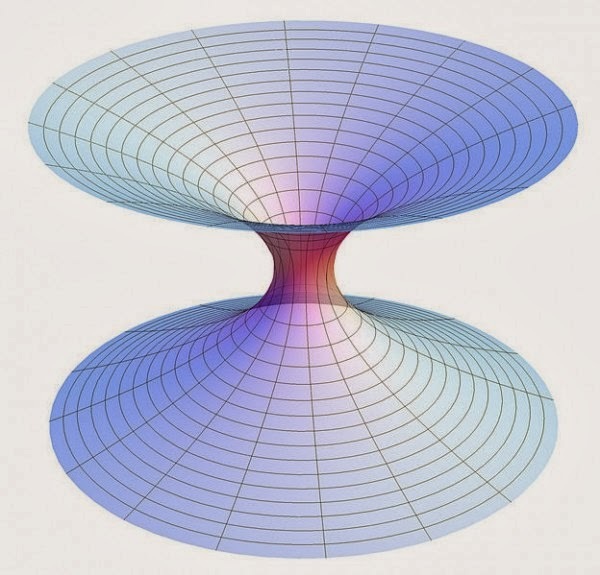 Physicists like Nathan Rosen and Einstein used the theory of general relativity in 1935, to introduce the existence of bridges through space time and the wormhole is known as an Einstein Rosen bridge which is considered a hypothetical topological feature of space-time with shortcuts through space time. These paths known as wormholes or Einstein Rosen bridges form a connection between two different points in space time creating shortcuts which can reduce the distance and time. A simple version of the wormhole is to visualize space as a two dimensional surface of a tube which connects various points of the surface where the mouths of a wormhole are analogous to the holes at both ends of a two dimensional surface. No observational evidence has been found for wormhole though the equation of general relativity has resulted in valid solutions containing wormholes. Due to its theoretical strength, it is one of the great metaphors in general relativity. And the first kind of wormhole discovered was the Schwarzschild wormhole. This is present in Schwarzschild metric which explains an eternal black hole though it was observed that this particular type of wormhole collapsed quickly for anything to cross from one point to the other. While wormholes which could be crossed from both ends known as traversable wormholes would only be possible, if exotic matter combined with negative energy density was used to stabilize them. When the wormhole contains adequate exotic matter either naturally or artificially, it could be used as a method of sending travelers or information through space. Adding exotic matter to wormhole to some extent might stabilize the same to a point where travelers there might be a possibility of the addition of regular matter which would be sufficient to destabilize the portal. Besides connecting two separate regions within the universe, wormholes could also connect two different universes and some scientists presume that if one mouth of a wormhole is shifted in a specific manner, it could be used for time travel though there is a controversy according to British cosmologist Stephen Hawking that this argument is not possible. Present time technology is insufficient to stabilize or enlarge wormholes if they could ever be found though scientist are still debating on the possibility of exploring the concept in obtaining a method of space travel where technology could be utilized. 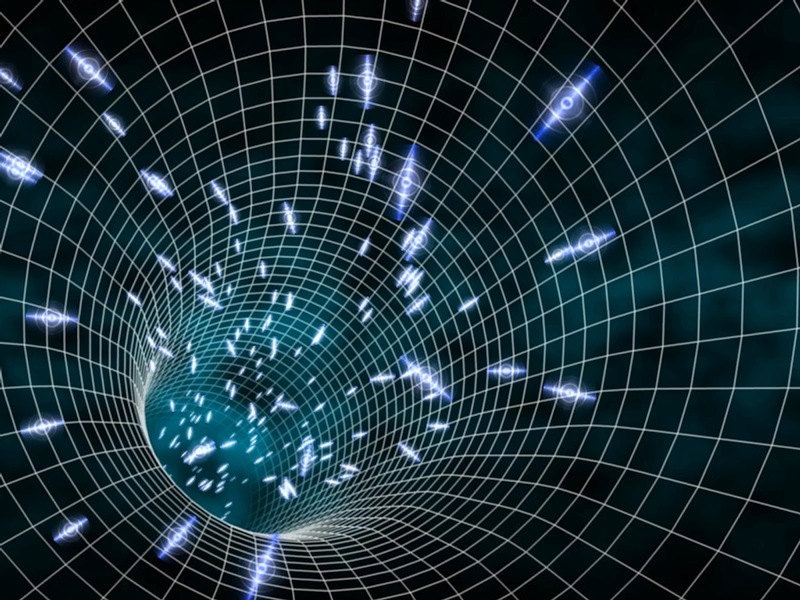 Without directly observing a wormhole, scientists can only wonder on how they could operate. Some are of the opinion that a black hole, at a point in space time where gravity is the strongest, with no possibility of light could serve as an entrance and this opening could be connected to a tube which would empty from a white hole from which point matter and light would exit. Chances are less that this type of wormhole can be used for space travel where the passages are likely to prevail only on small subatomic scale and if large enough to traverse, the gravitational forces would enable them to collapse at an instant, on opening. Scientist are of the belief that wormholes which are made of hypothetical exotic matter could contain negative energy to stay stable with the addition of outside object such as a spaceship, would result in the tunnel falling apart. The Einstein Rosen wormhole would not be considered useful for travel since they collapse quickly though recent research indicate that a wormhole containing exotic matter can stay open without changing for a long period of time. 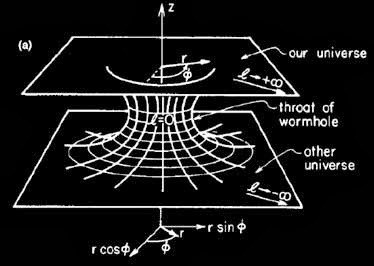 The theory of Einstein on general relativity, mathematically relates the presence of wormholes though none have been discovered till date. A case of negative mass wormhole could have been discovered whose gravity is so intense that even light cannot escape. Certain solutions of general relativity could be considered for the existence of wormholes wherein the mouth is a black hole though a naturally formed black hole occurred during the collapse of a dying star could not be considered for the creation of a wormhole. Since it cannot be seen, NASA scientists focused on the tiny core of the galaxy M87 instead which was a super massive cosmic engine, 50 million light years from the earth and astronomers indicated that the core of M87 contained ferocious swirling maelstrom of superhot hydrogen gas which spun at 1.2 million miles per hour. In order to keep this disk of spinning gas from flying violently apart in various directions, a colossal mass concentrated at the center, weighing around 2 to 3 billion sun was essential. According to Davis’ publication in July in the American Institute of Aeronautics and Astronautics journal, reference is made to time machines with the possibility that wormhole could become or could be used as a means to travel back into time. Moreover he relates that scientist’s understanding of the laws of physics are connected with time machine where there are numerous space time geometry solutions to portray time travel or have properties of time machines. A wormhole would probably permit a ship to travel from one point to another much quicker than the speed of light since the ship would arrive at its destination faster than a beam of light by taking a shortcut through space time through the wormhole. Thus the vehicle does not actually break the universal speed limit, the speed of light where in fact the ship never really travels at a speed faster than light. A wormhole could be utilized to cut through space as well as through time.